If you're hoping to marry surrounded by nature, here are our favorite outdoor wedding venues in San Diego. If you’re getting married in San Diego, you’re the envy of many an engaged couple. 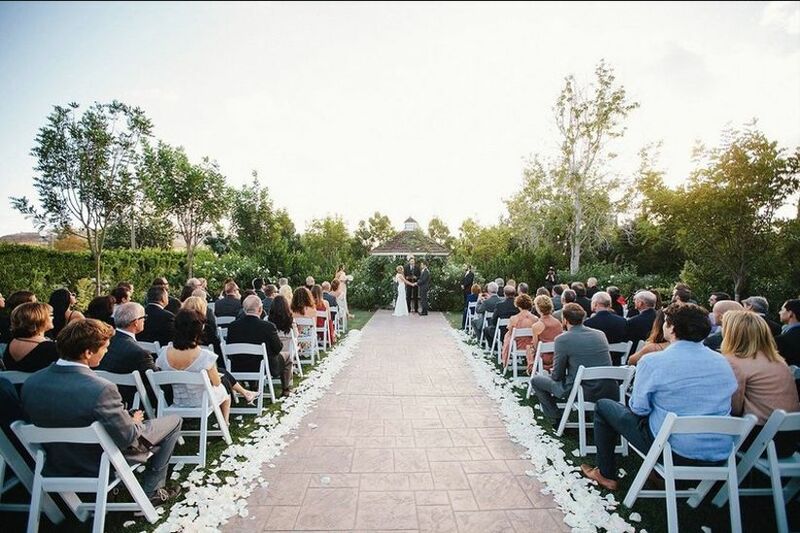 Truly, outdoor wedding venues in San Diego are some of the most desirable in the entire country—possibly even the world. With all the incredible San Diego wedding venues to choose from, it all comes down to determining the type of location you’re looking for—a hotel full of fabulous amenities and convenience, beaches, a breathtaking vineyard, a gorgeous country club, or something completely different. 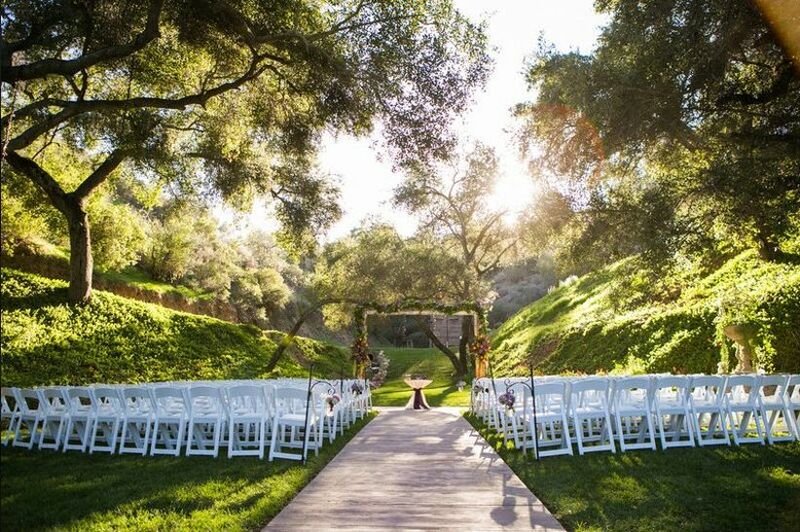 Prepare to be wowed by these outdoor wedding venues in San Diego. 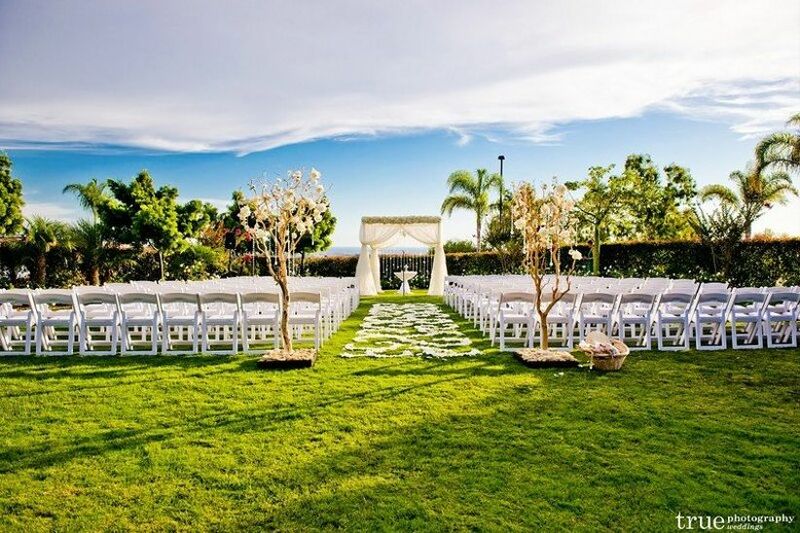 This site is one of the outdoor wedding venues in San Diego that offers the best of both worlds. You can get married with the ocean as your backdrop, or in a European Courtyard surrounding by bougainvillea. Receptions are held in the stunning ballroom. Your photographer will be floored by all of the amazing photo ops here. The Cuvier Club is one of the most popular San Diego wedding venues, and won a WeddingWire Couple’s Choice Award in 2017. If you want to be surrounded by nature on your wedding day, look no further than this mountain venue in Julian. This rustic venue is ideal for smaller weddings of up to 125 guests—and allows your guests to stay on the beautiful ranch as well for a true destination wedding feel. 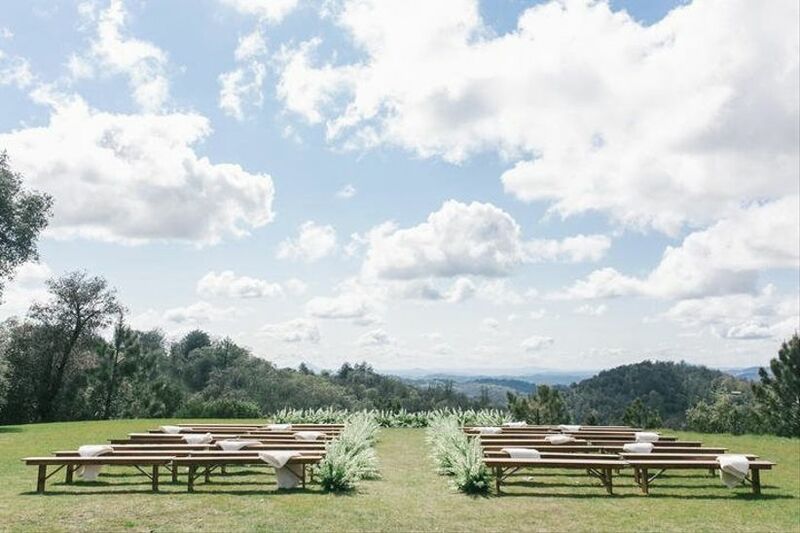 Ceremonies take place on a mountain with breathtaking views, and receptions can be held outdoors as well! 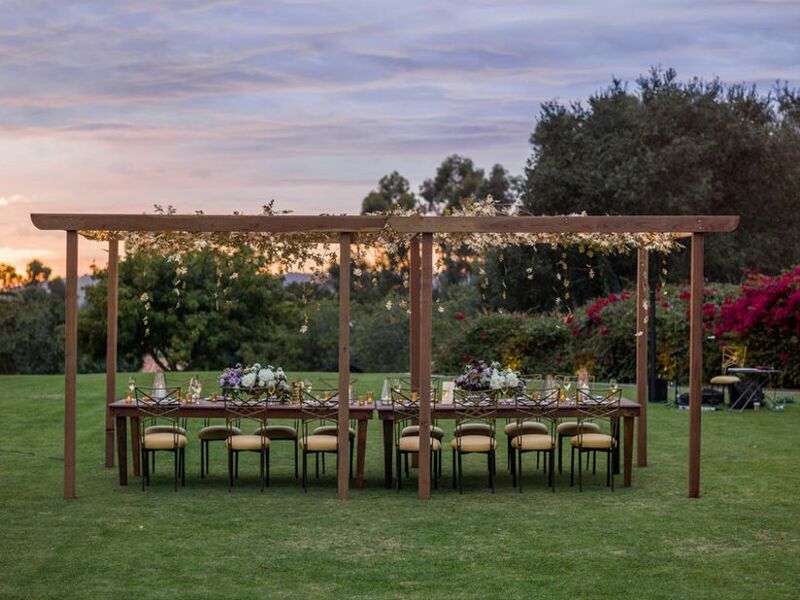 Located in North San Diego, this stunning private estate offers a lake, gorgeous meadows, a vineyard, and even a bed and breakfast where you can spend your pre-wedding night on premises. 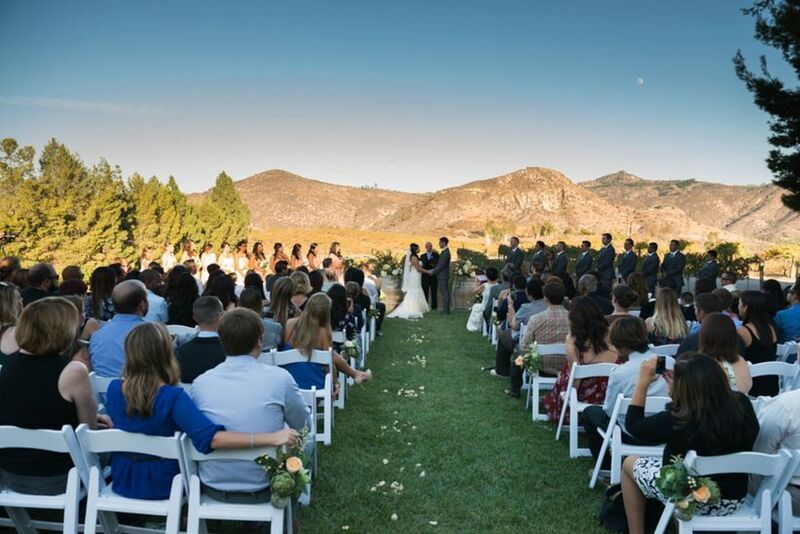 Not only does this venue feature some of the most beautiful scenery in the area (hello, mountain views! ), it’s also an all-inclusive location, with catering and rentals included with your package. One of the best amenities? An actual boat that provides an incredible grand entrance or exit for the newlyweds. There are so many advantages to having your wedding at a hotel—from the convenience of having your guests stay on site, to the many amenities and activities. The Dana on Mission Bay has all this and more—it’s one of the most stunning outdoor wedding venues in San Diego. 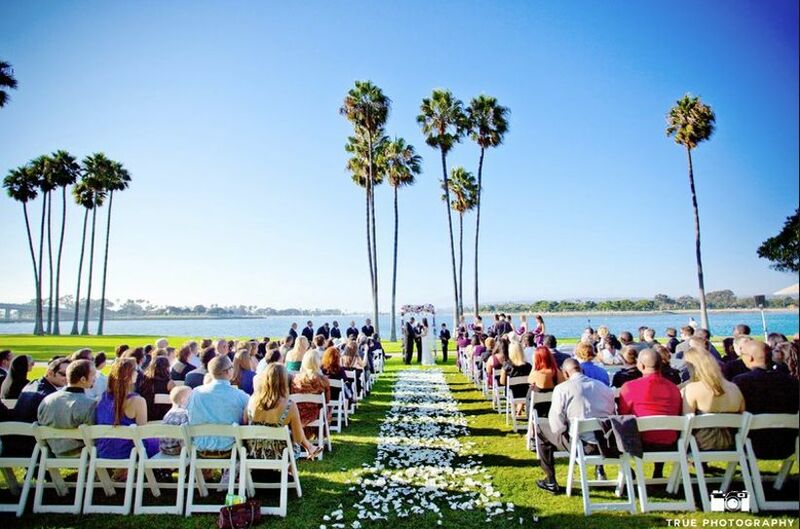 Ceremonies take place in one of three locations—the Tropical Courtyard, the Marina Garden (with water views!) or the Sunset Lawn, which has the bay as its backdrop. Receptions are usually held in the modern Mission Bay Ballroom or in the Marina Garden. This venue can host weddings of up to 250 guests. While Northern California is typically known as the spot for vineyards and wineries, there are many in SoCal as well. 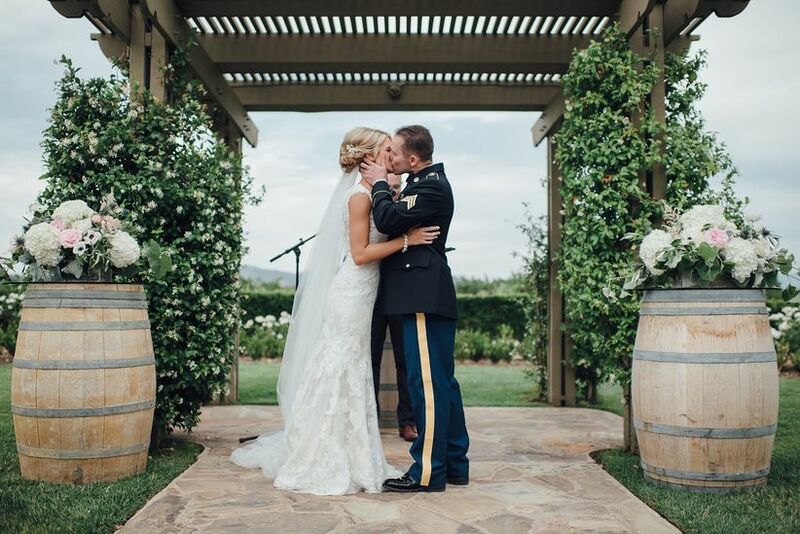 The Ponte Winery and Vineyard Inn is one of the most popular outdoor wedding venues near San Diego—in fact, it’s won the WeddingWire Couple’s Choice Award four years in a row. 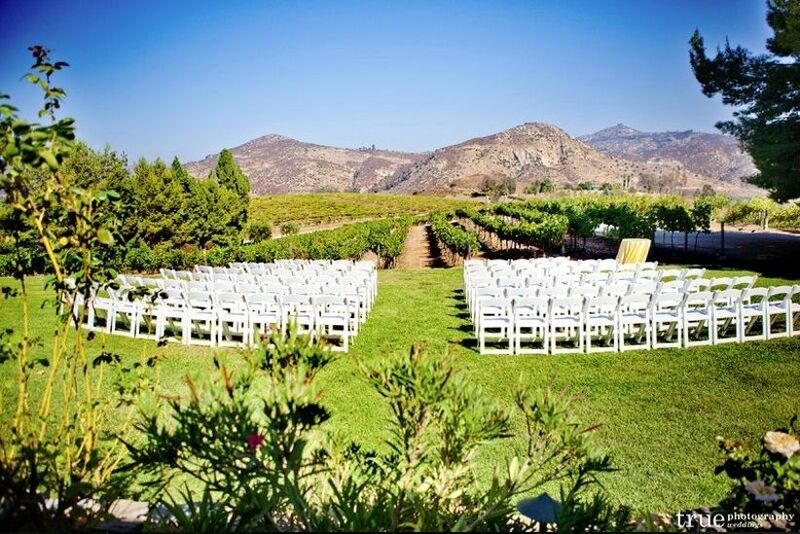 Outdoor ceremonies can be held in the Vineyard Garden, with the vines as your backdrop or, for smaller ceremonies, The Pond at Ponte Vineyard Inn is a serene and stunning locale. There’s also indoor space for ceremonies—the Barrel Room is an oh-so-cool locale. There are three lovely indoor spaces for receptions, including the Vineyard Pavilion, which features vaulted ceilings and crystal chandeliers for a glam-ranch feel. Country clubs are among our favorite wedding venues—they’re pros at putting together events, with catering and rentals on site. This San Diego wedding venue is one of the most scenic we’ve seen, with a gorgeous outdoor gazebo for your ceremony and a fabulous Mountain View Terrace Room with 180-degree views of the mountains. This is another popular area wedding venue—couples rave about the service and the food! 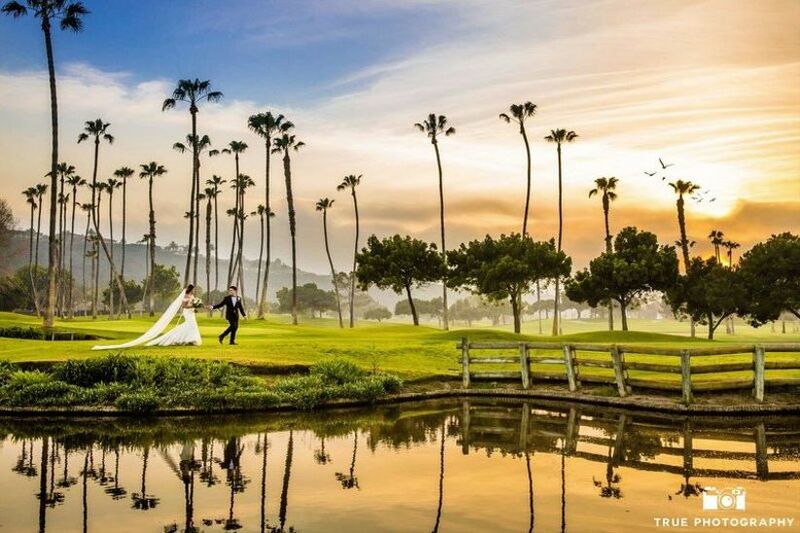 This hotel is one of the beautiful outdoor wedding venues in San Diego, with its views of the Pacific Ocean and the famed Torrey Pines Golf Course. The impeccably-manicured gardens, particularly the Parterre Garden and the Fairway Garden, are ideal spaces for your ceremony, with their tropical flora. And with three ballrooms to choose from, you’re sure to have a wedding that fits your style and personality. And with a capacity of 700 guests, there’s certainly plenty of space! 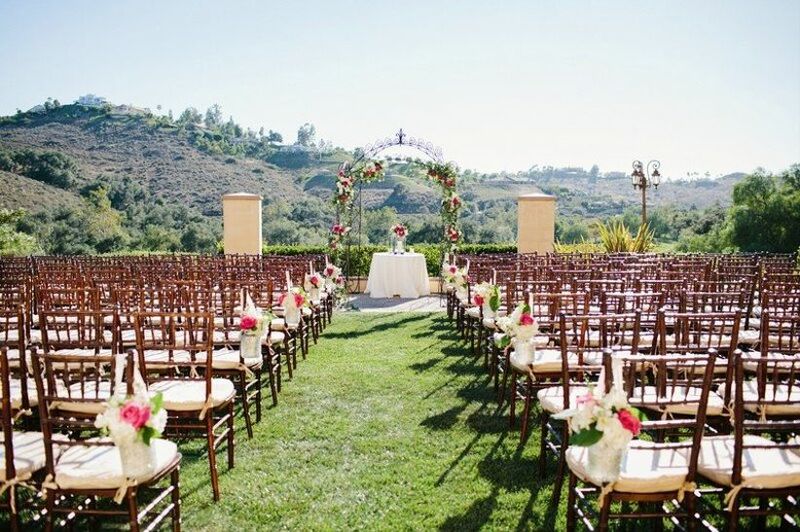 This scenic outdoor wedding venue near San Diego lives up to its name—yes, it is a country club, but has a Spanish ranch feel that’s totally unique. From the incredible palm trees to the amazing photo backdrops, you and your guests will be wowed by the landscape at this wedding venue. We also love the indoor reception space—the huge windows give it an outdoor feel. Rolling landscape? Ocean views? 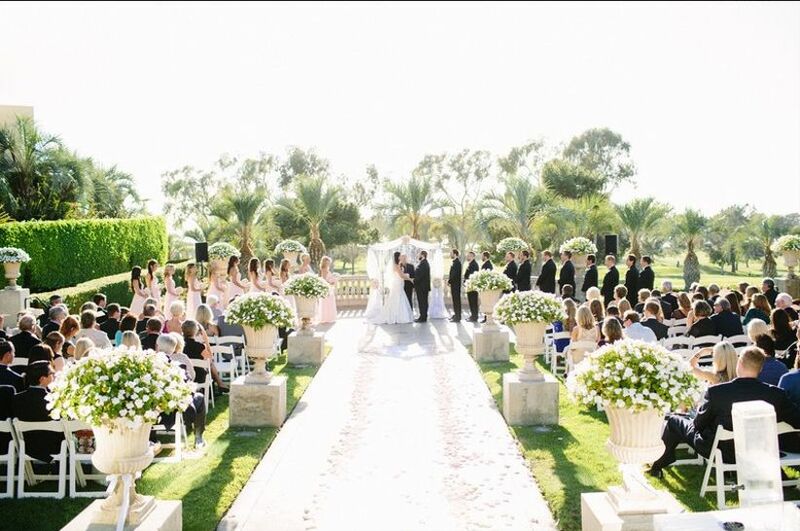 No wonder this resort is one of the most popular outdoor wedding venues near San Diego. 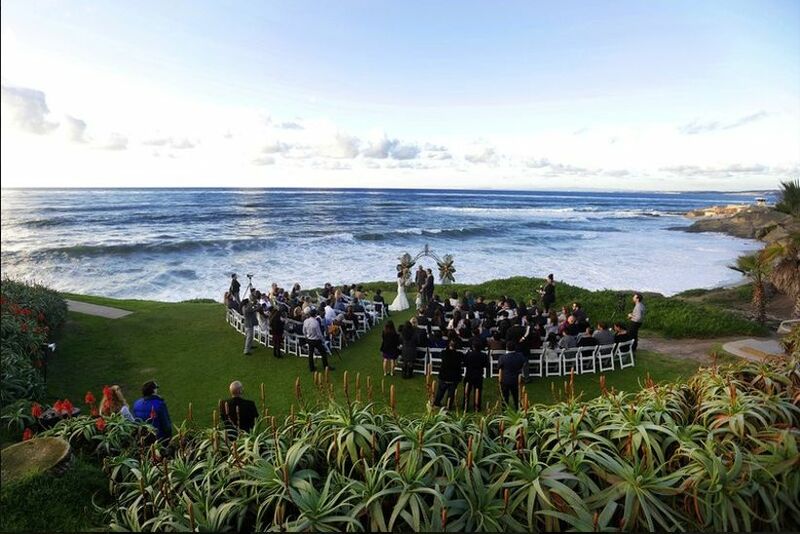 The Ocean Blue Lawn and the Pacific Lawn are both stunning outdoor ceremony spots, with breathtaking views. There are also two ballrooms to choose from for your reception. And—bonus!—the onsite restaurant Twenty/20 is a popular spot for rehearsal dinners and other pre- and post-wedding events. We love the private and serene feel of this resort and San Diego wedding venue. 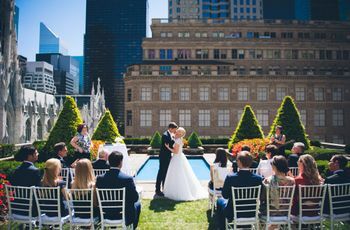 From the Croquet Lawn to the Valencia Lawn, the Sunset Room, and the Terrace Room, there are lots of spaces where you can host your big day—both completely outdoors or indoors. In particular, we love the resort’s Spanish architecture and the variety of photo backdrops you’ll find. This wedding venue near San Diego is one of the only in the area with its own dedicated bridal house—a space perfect for the wedding party to prep before the big day. 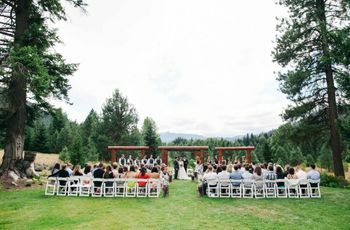 And the ceremony space is one of the most gorgeous we’ve seen, overlooking mountains, lakes, and waterfalls. 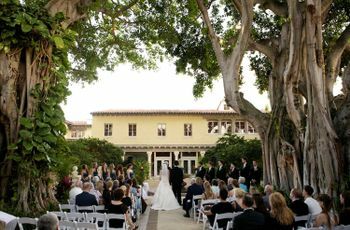 This is among the most well-regarded outdoor wedding venues near San Diego, and won a Couple’s Choice Award in 2017. Vineyards are among the most popular San Diego wedding venues, whether you’re a wine-lover or not. And with this vineyard’s mountain backdrop, it’s no wonder that this is one of the most popular vineyard venues in the area. The tented patio makes a perfect spot for a reception. 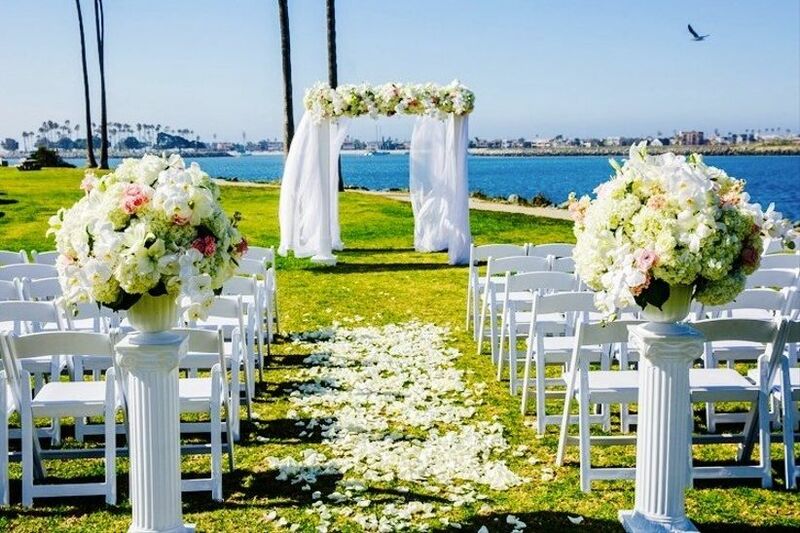 This hotel and outdoor wedding venue in San Diego offers several outdoor spaces for wedding ceremonies, with many overlooking the water. And the indoor reception spaces offer the best of both worlds, from the Bayview Ballroom with panoramic Pacific Ocean views to the Mission Ballroom located next to the marina. Plus, the convenience of a hotel San Diego wedding truly can’t be beat.